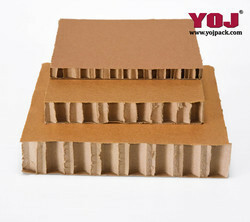 Honeycomb paper boards are made up of kraft paper which is mainly used as raw material for packaging purposes. Honeycomb paper boards are available in variety of thicknesses and therefore mainly used as buffer in boxes. Honeycomb boards are modified to fill the void spaces in box. This will ensure that product will not shake or misplace from its place inside the box. The honeycomb boards are used as buffers, separators, cushions, fitments, base, support inside the box. We can also use honeycomb boards to make display panels for more info. Please visit Honeycomb panels. 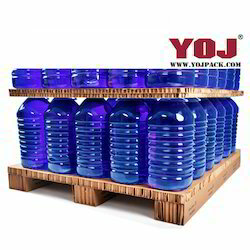 • These boards guarantee the transport of almost any product without damage. • Paper honeycomb boards are also made of recycled paper and are 100% recyclable. • Special offers for Packaging Industries. The honeycomb panel is nothing but the layer of high grade paper and honeycomb core. The main strength is in core, Honeycomb core is flexible and can be stretched up to 15 times its original size. The top and bottom papers are also called as “outliners”. Outliners are useful to keep honeycomb core at its position, making it straight and stable. Sandwiching mainly involves gluing and heat treatment. The honeycomb panels are used as Stackers, partition for portable cabins, writing boards, portable sofa and many more. There are special companies who make custom-made panels and furniture by honeycomb panels. • Suitable as a core material between facings of softwood, paperboard, plywood, plasterboard, chipboard, MDF, HDF, melamine and steel. We are the only manufacturers in Maharashtra state, there are a wide range of Honeycomb Boards available with us. we also provide customized Honeycomb Packaging Solutions. The product promises to significantly reduce the carbon footprints of users through this 100% recyclable and single-material carton packaging. Lowers the cost of packaging as it eliminates the need for supplementary packaging material. This also means lesser storage space as well as labour. Finds wider and newer applications as an effective substitute to wood and EPS/Styrofoam. It is fully recyclable and biodegradable. It offers strong and high resistance to vertical compression. It is easy and safe to handle and use. An effective material and method to discharge our responsibility towards the protection of our environment and earth. Paper honeycomb is an excellent core for all types of interior doors by virtue of their high pressure strength. they are ideal substitute to traditional solid fillings, chipboard strips or tube boards. · They can be used in flat doors, moulded doors, steel doors as well as standards hardboard doors. · Paper honeycomb offers unmatched glue bonding with UF,PUR Hot melt when used between hardboard, MDF, Steel and melamine facing plates. Paper honeycomb is also used as a low-cost core or filling material in doors of buses, trains, elevators and as in-room or spatial partitions. “Honeycomb separator boards” are advanced version of Honeycomb Boards, the separator ensures better stability. Unlike other conventional fitments, honeycomb fitments are very easy to install and lightweight. It is highly preferred by customized packaging companies.